Trust in businesses is eroding, and so is patience. Marketing and sales are getting harder, and the math behind most companies’ acquisition strategy is simply unworkable. The best point of leverage you have to combat these changes? An investment in customer service. The way people interact with businesses has changed -- again. The internet’s rise three decades ago did more to change the landscape of business than anyone could have imagined in the 1990s. And now it’s happening again. Rapid spread of misinformation, concerns over how online businesses collect and use personal data, and a deluge of branded content all contribute to a fundamental shift -- we just don’t trust businesses anymore. We used to trust salespeople, seek out company case studies, and ask companies to send us their customer references. But not anymore. Today, we trust friends, family, colleagues, and look to third-party review sites like Yelp, G2Crowd, and Glassdoor to help us choose the businesses we patronize, the software we buy, and even the places we work. 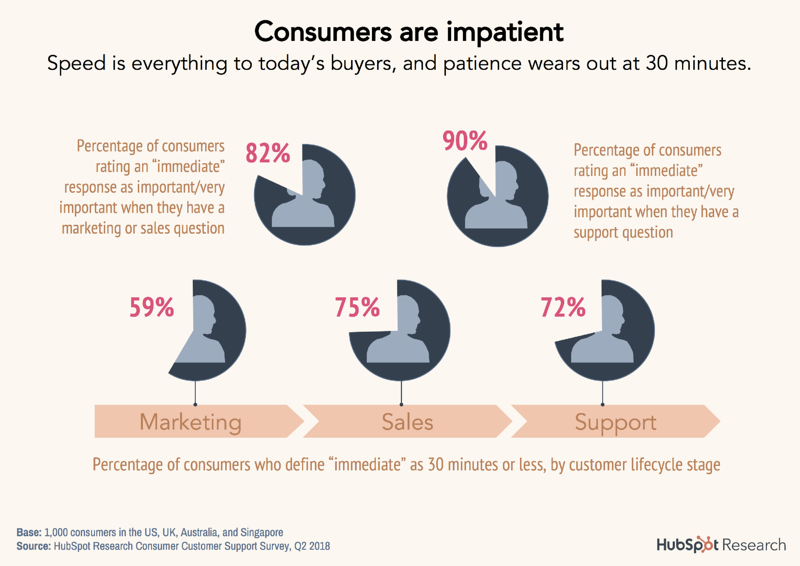 Consumers are also becoming more impatient, more demanding, and more independent. In a survey of 1,000 consumers in the United States, United Kingdom, Australia, and Singapore, we found that 82% rated an immediate response as “important” or “very important” when they were looking to buy from a company, speak with a salesperson, or ask a question about a product or service. That number rises to 90% when looking for customer service support. But what does “immediate” mean? Over half (59%) of buyers expect a response within 30 minutes when they want to learn more about a business’ product or service. That number rises to 72% when they’re looking for customer support and 75% when they want to speak with a salesperson. Modern consumers are also unafraid to tell the world what they think. Nearly half (49%) reported sharing an experience they had with a company on social media, good or bad. While buyers are fairly even split between being more likely to share a good experience (49%) vs. a bad one (51%), every customer interaction you have is an opportunity to generate buzz -- or risk public shaming. The hard truth is that your customers need you a lot less than they used to. They learn from friends, not salespeople. They trust other customers, not marketers. They’d rather help themselves than call you. 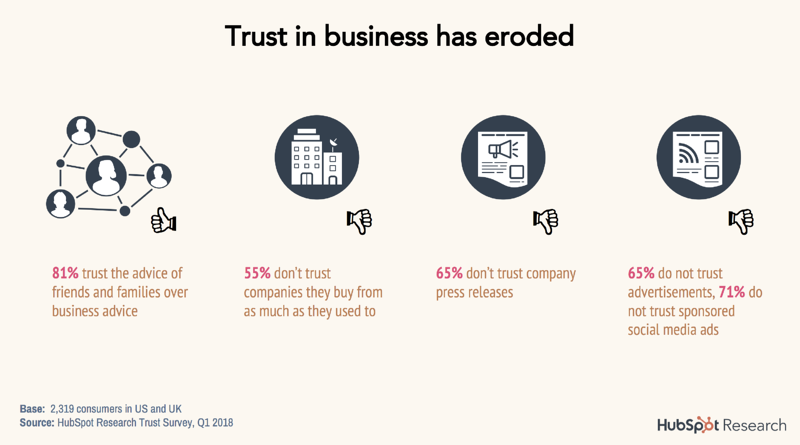 The erosion of consumer trust is a difficult issue for companies to grapple with on its own. But as if that wasn’t enough, the internet, which has always fundamentally transformed the traditional go-to-market strategy, is moving the goalposts again. Let’s break this down into two functions: Marketing and sales. We’ve taught inbound marketing to tens of thousands of companies and built software to help them execute it. Inbound marketing accelerated business growth through a repeatable formula: Create a website, create search-optimized content that points to gated content, then use prospects’ contact information to nurture them to a point of purchase. This still works — but the market is experiencing four trends that, combined, have made it harder for growing businesses to compete with long-established, better-resourced companies. Much of modern marketing is dependent on getting found online. Without the multimillion-dollar brand awareness and advertising budgets of consumer goods titans, the best way a growing business can compete is creating content specific to their niche and optimizing it for search. Google, the arbiter of online content discoverability, has made significant changes in the last few years that make it harder for marketers to run this model at scale without a financial investment. First, through featured snippets and “People Also Ask” boxes, Google is reclaiming its own traffic. A featured snippet is a snippet of text that Google serves on the search engine results page (SERP). 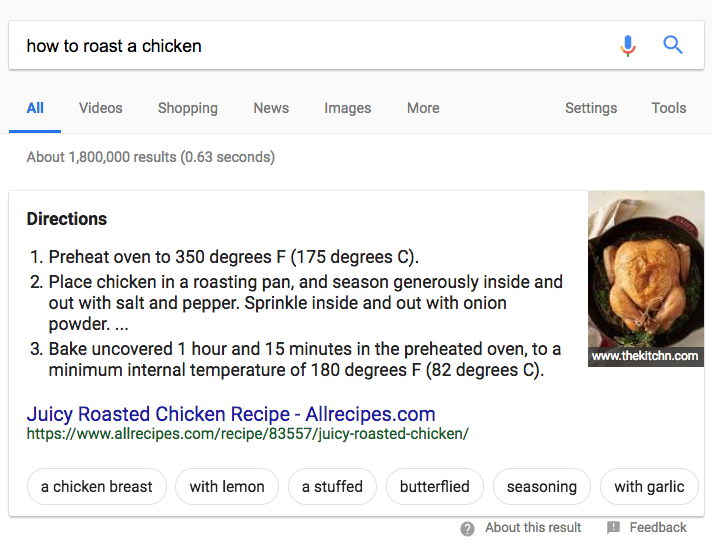 You’ve likely been served a featured snippet when you were searching for a definition, or something that involved a step-by-step explanation. Here’s an example of a featured snippet. It’s designed to pull information onto the SERP itself so there’s no need to click into the full recipe, hosted on another website. 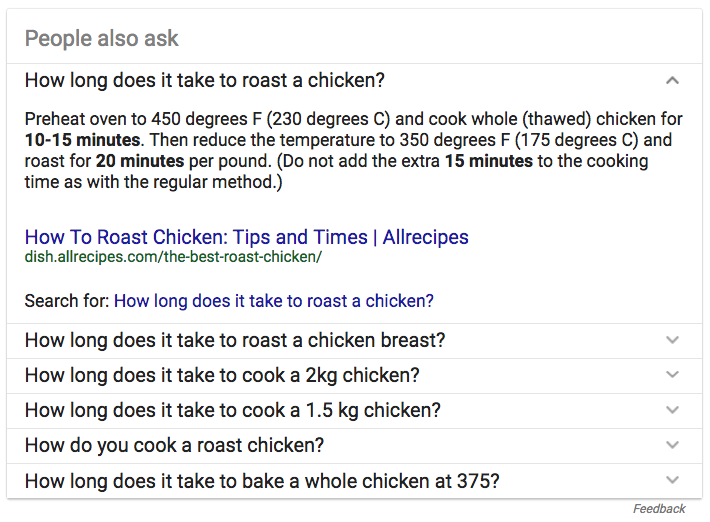 Each time you expand a “People Also Ask” section, Google adds 2-4 queries to the end of the list. The combined effect of featured snippets and “People Also Ask” boxes? It depends. If your site is the first result and gets featured in the snippet, your traffic should increase. But if you don’t win the featured snippet, even if your post is ranked at position 1, it’s likely your overall traffic will decrease. Second, Google’s also changed its search engine results page (SERP), moving search ads from a sidebar to the top four slots. Organic results fall much further down the page, and on a mobile device they disappear entirely. Search won’t ever become purely pay-to-play. But in a world where screen real estate is increasingly dominated by sponsored content, marketers need to factor paid tactics into any organic strategy. Voice search adds a third wrinkle to these shifts -- the winner-take-all market. As the use of voice search has proliferated, it’s become more and more important to become the answer, as voice assistants only provide one result when asked a question. On Google, featured snippets demonstrate this necessity. Amazon has also introduced “Amazon’s Choice” products, the first items suggested when consumers order items via voice assistant. It’s not hard to imagine a future where all Amazon’s Choice products are also Amazon-branded, manufactured, and distributed. A decade ago, social media sites were promotion channels that served as a path between users and the poster’s site. 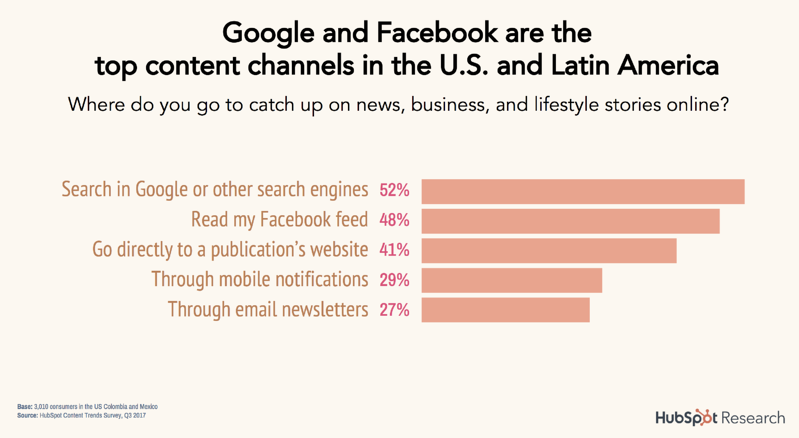 The borders between different sites were fluid -- people would discover content on Facebook, Twitter, and LinkedIn, then click through to content (usually hosted on another site). Today, social media sites are walled gardens. Algorithms have been rewritten to favor onsite content created specifically for that platform. Facebook Messenger and evolving paid tools like Lead Ads are becoming a table-stakes marketing channel, meaning businesses can’t just “be on Facebook” -- they must recreate their marketing motion in a second place. Facebook and LinkedIn have also deprioritized showing content that links offsite in favor of family and friends’ content (on Facebook) and onsite video and text (on LinkedIn). Not only does your branded content have a harder time competing with other brands, it will also have to compete for attention with your prospects’ personal network. Twitter’s investment in streaming video partnerships with entertainment and news networks are a nod to bringing consumers content they’d watch anyway in a platform-owned experience. Sites like Amazon and Facebook are also becoming starting points for search. Over half of product searches (52%) begin on Amazon, while 48% of searches for content originate on Facebook -- almost equivalent to Google’s reach (52%). And both Amazon and Facebook sell targeted advertising space. These algorithm changes reflect the desire companies have to keep the audiences they own, on their own sites. As long as they can monetize their traffic, they have no incentive to move back to the old passthrough model. Increasingly, Facebook is a destination. Twitter is a destination. LinkedIn is a destination. It’s no longer enough to create a piece of content for your own site, then schedule out promotion across channels that point back to that content. Savvy marketers know their ideas must be channel-agnostic and channel-specific at the same time. To get the most mileage out of a piece of content, its core concept must perform well across multiple channels, but marketers have to do more upfront work to create separate versions of this content to best suit the channel on which it’s appearing. 1. Organic acquisition costs are rising. According to ProfitWell, overall customer acquisition costs (CAC) have been steadily rising for B2B and B2C companies. 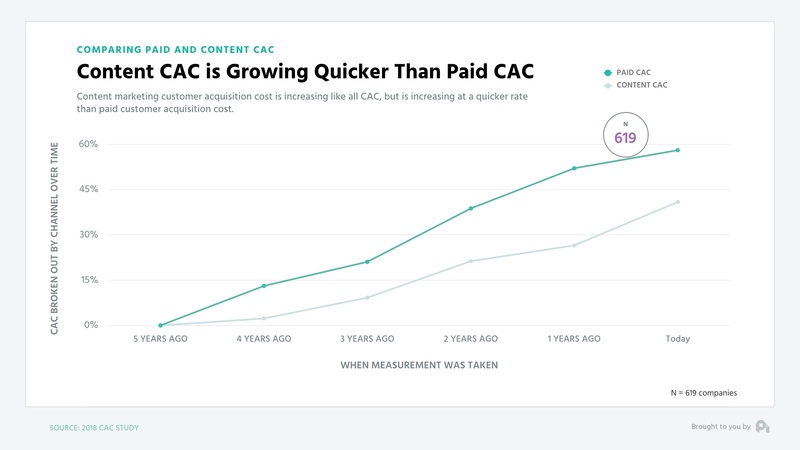 Over the last five years, overall CAC has risen almost 50% -- and while paid CAC is still higher than content marketing (organic) CAC, organic costs are rising at a faster rate. 2. Content marketers are commanding higher salaries. It’s not only harder to get value from content, it’s getting more expensive to create it. 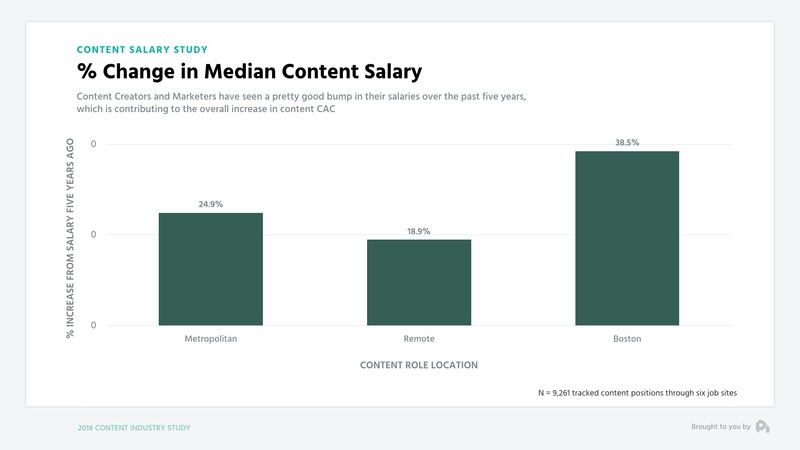 ProfitWell’s study examined the rise of content marketers’ salaries by location -- median salary has risen 24.9% in metropolitan areas and 18.9% for remote workers in the last five years. This rise is partially explained by changes in the content marketing profession. Google’s changing algorithm requires more specialized knowledge than ever. Not only are there specific optimization best practices to win featured snippets, Google’s current algorithmic model favors sites that are architected using the topic cluster model. Depending on the size of your site, this can be a massive undertaking -- at HubSpot, it took us over six months to fully organize our blog content by this model. The following is not legal advice for your company to use in complying with EU data privacy laws like the GDPR. Instead, it provides background information to help you better understand the GDPR. This legal information is not the same as legal advice, where an attorney applies the law to your specific circumstances, so we insist that you consult an attorney if you’d like advice on your interpretation of this information or its accuracy. In a nutshell, you may not rely on this as legal advice, or as a recommendation of any particular legal understanding. The General Data Protection Regulation recently passed by the European Union (EU) imposes new regulations on how businesses are allowed to obtain, store, manage, or process personal data of EU citizens. GDPR doesn’t go into effect until May 25, 2018, so it’s hard to predict the exact impact it will have on lead generation and collection. But we feel confident that GDPR is the first step toward more regulation of how businesses interact with consumers globally, further limiting your marketing team’s power. So it’s getting harder to get prospects to your site. But once you get them in the door, it should be standard operating procedure to getting those deals closed, right? Turns out … not quite. Every year, HubSpot surveys thousands of marketers and salespeople to identify the primary trends and challenges they face. And year after year, salespeople report that their jobs are becoming more difficult. Consider this chart (a preview of State of Inbound 2018). 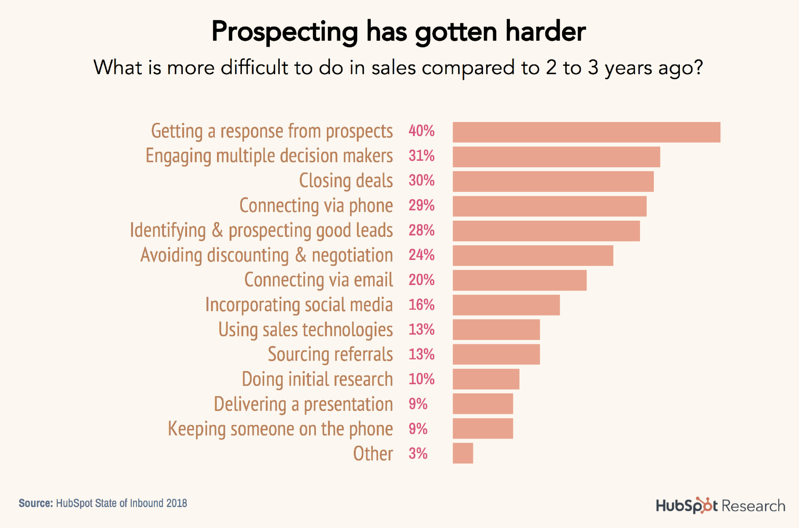 A whopping 40% of respondents reported that getting a response from prospects has gotten harder, while 29% and 28% respectively identify phone connections and prospecting as pain points. Almost a third (31%) have to engage with multiple decision makers to move a single deal forward, and just as many find it difficult to close those deals. Salespeople have to overcome an additional challenge on top of these sobering statistics: They aren’t trusted. Year over year, consumers report that salespeople are their least trusted source of information when making purchase decisions. And even when there’s no purchase decision being made, salespeople don’t have a great reputation. 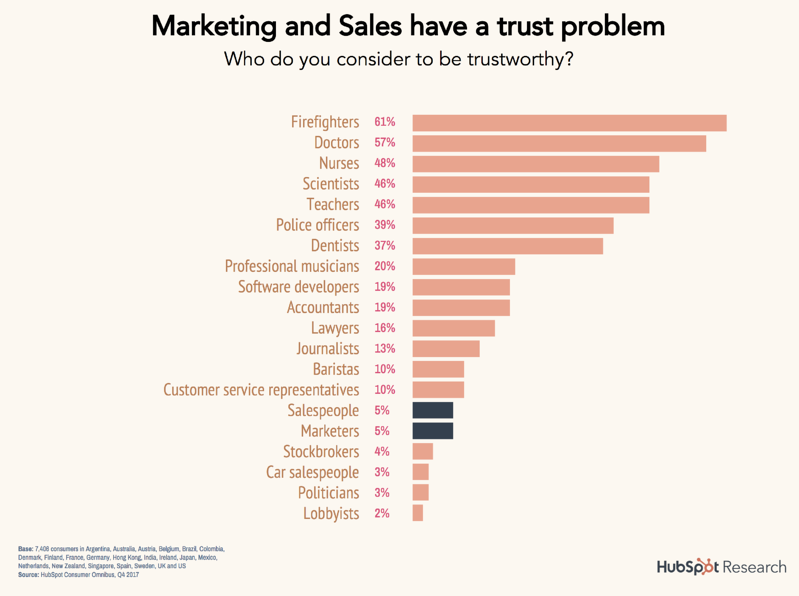 A 2016 HubSpot study found that sales and marketing are among two of the least trusted professions -- only above stockbrokers, car salesmen, politicians, and lobbyists. For software companies, sales is becoming a more technical field. Buyers contact sales later in the process -- more prefer a “try before you buy” approach through free trials or “freemium” versions of paid products. At these companies, the actual onboarding flow and user experience of the product are often more important than the sales team, as most customers become free users before ever speaking with a human. In the same way that a big chunk of sales work was consumed by marketers 10 years ago, a big chunk of sales work today is being consumed by developers and growth marketers. The implications are clear. Buyers no longer rely on salespeople to steward them through a purchasing process, preferring to do independent research or lean on their networks for an opinion. The inherent distrust of the profession is diluting salespeople’s influence salespeople in a purchasing process, making your acquisition strategy less and less consistently reliable. This is scary stuff. But there’s a bright side. Within the pain of change lies opportunity, and your business boasts a huge, overlooked source of growth you probably haven’t invested in at all -- your customers. For many years, most businesses (us included) focused on lowering CAC. Inbound marketing made this relatively easy, but the new rules of the internet mean this is getting harder. As Facebook, Amazon, and Google tighten their grips on content, the big opportunity for today’s companies is raising LTV. If your customers are unhappy, you might be in trouble. But if you’ve invested in their experience, you’re well-poised to grow from their success. When you have a base of successful customers who are willing and able to spread the good word about your business, you create a virtuous cycle. 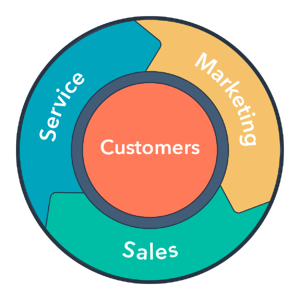 Happy customers transform your business from a funnel-based go-to-market strategy into a flywheel. Through promoting your brand, they’re supplementing your in-house acquisition efforts. 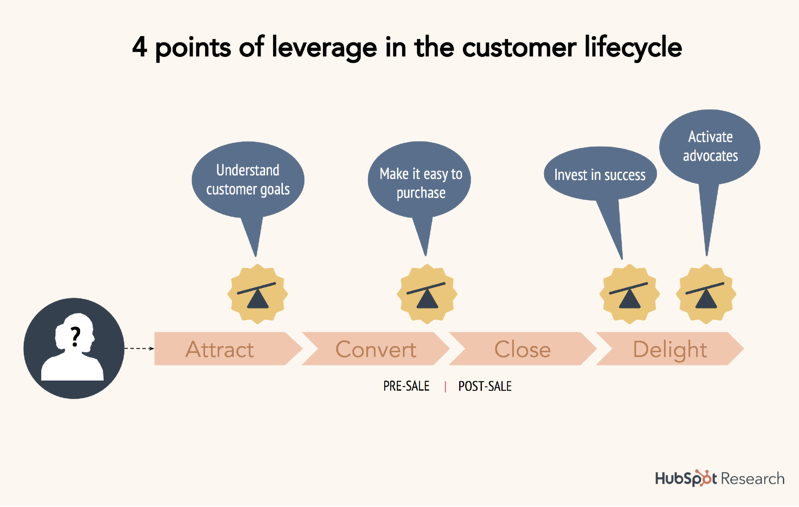 This creates a flywheel where post-sale investments like customer service actually feed “top of the funnel” activities. Buyers trust people over brands, and brands are getting crowded out of their traditional spaces, so why throw more money at the same go-to-market strategy when you could activate a group of people who already know and trust you? Customers are a source of growth you already own, and a better and more trusted way for prospects to learn about your business. The happier your customers, the more willing they are to promote your brand, the faster your flywheel spins, and the faster your business grows. Not only is this the right thing to do by your customers, it’s the financially savvy thing to do for your business. It’s a win-win-win. 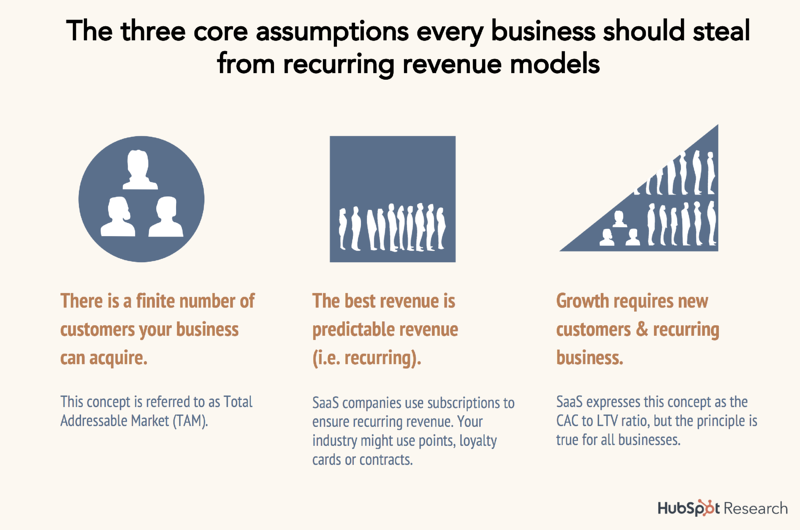 More and more businesses are moving to a recurring-revenue, or subscription-based model. A recurring revenue model means customers pay a monthly fee for membership or access to products. A recurring revenue model makes it easy to project expected revenue over a set period of time. Understanding how money moves in and out of the business makes headcount planning, expansion planning, and R&D efforts far easier. Luckily it doesn’t matter if your company is subscription-based or not -- a recurring revenue model contains lessons that apply to all businesses. Before we dive in, there are three core assumptions this model relies on. First, every business has a defined total addressable market, or TAM. Your TAM is the maximum potential of your market. It can be bound by geography, profession, age, and more -- but in general, every product serves a finite market. Third, the key to growth is to retain the customers you already have, while expanding into the portion of your TAM that you haven’t won yet. The easiest way to understand why thinking about your business like a subscription-based company does is valuable is to walk through the following hypothetical example -- let’s call it Minilytics Inc.
Minilytics starts with a customer base of 10 people, and a churn rate of 30% -- meaning three of their customers will not buy from them again. Each of Minilytics’ salespeople can sell five new customers per month. 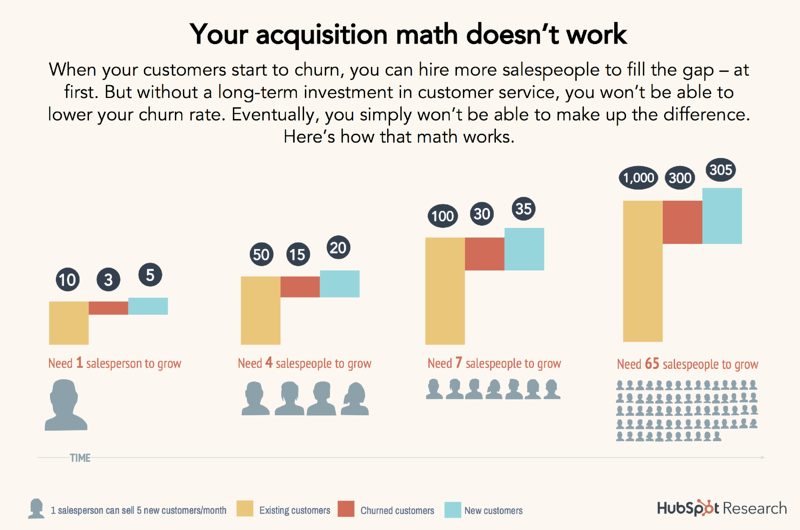 Because Minilytics’ customer base is so small, they only need to hire one salesperson to grow. Fast forward several months, and Minilytics now has 50 customers, 15 of whom churn. To grow, Minilytics’ CEO has to bring on three more salespeople, who create additional overhead cost -- their salaries. You can probably see where this is going. At 100 or 1,000 customers, Minilytics’ CEO simply cannot hire enough salespeople to grow. The sheer cost of paying a staff to simply maintain a business that’s losing 30% of its customers each month will shutter most businesses on its own. While Minilytics is struggling to plug the leaks in its business, something else is happening that will tank the company -- even with an army of salespeople. Remember TAM? While Minilytics’ CEO was hiring salespeople to replace churned customers, the company was also rapidly burning through its TAM. Generally, customers that churn do not come back -- it’s hard enough to gain a consumer’s trust. To break trust through a poor experience, then try to rebuild it, is nearly impossible. Even if Minilytics is able to afford a rapidly expanding sales team, it’s been rapidly churning through its TAM. Eventually, Minilytics will run through its entire total addressable market -- and there will be no room to grow. Luckily, Minilytics isn’t destined for this fate. Let’s rewind to that first month and explore what they could have done differently. Growing a sustainable company is all about leverage. In plain English, if you can identify the parts of your business model that require great effort but provide little reward, then re-engineer them to cost you less effort or provide more reward, you’ve identified a point of leverage. Most companies hunt for leverage in their go-to-market strategy, which usually involves pouring money into marketing or sales efforts. 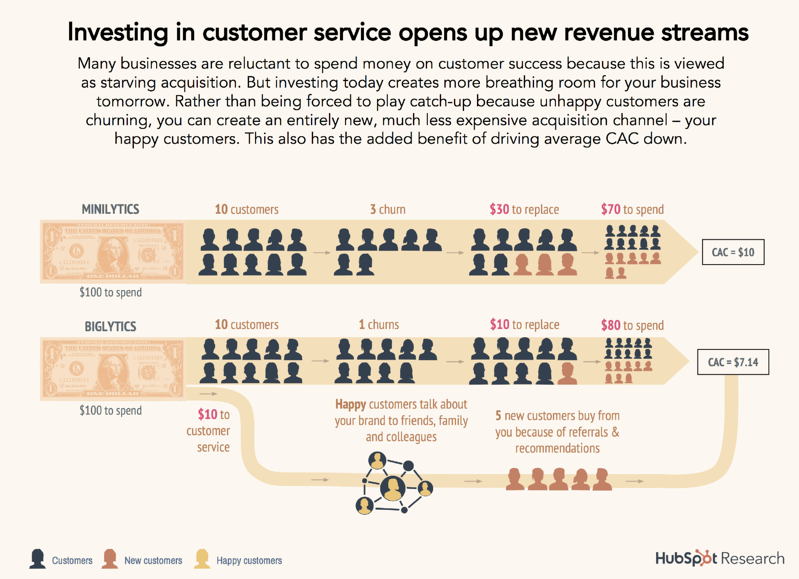 Customer service, customer success, customer support -- or whatever you call it (at HubSpot, we have a separate team dedicated to each function, but we’re the exception) -- has traditionally been viewed as a cost center, not a profit center. It’s not hard to understand why. The ROI of sales and marketing investment is immediately tangible, while investment in customer service is a long game. But most companies mistakenly try to optimize for fewer customer interactions, which just means issues don’t get addressed. Because they’re thinking short-term, it ends up costing them dearly in the long term. Too many businesses think once a sale is made and the check’s cleared, it’s on to acquire the next new customer. That doesn’t work anymore. The hardest part of the customer lifecycle isn’t attracting their attention or closing the deal -- it’s the journey that begins post-sale. Once your customers are out in the wild with your product, they’re free to do, say, and share whatever they want about it. Coincidentally, that’s when many companies drop the ball, providing little guidance and bare-bones or difficult-to-navigate customer support. This approach, quite frankly, makes no sense. Think about it this way: You control every part of your marketing and sales experience. Your marketing team carefully crafts campaigns to reach the right audiences. Your sales team follows a playbook when prospecting, qualifying, and closing customers. Those processes were put in place for a reason -- because they’re a set of repeatable, teachable activities you know lead to consistent acquisition outcomes. Once a customer has your product in their hands, one of two things will happen: Either they will see success, or they will not. If they’re a new customer or first-time user, they might need help understanding how to use it, or want to learn from other people who have used your product, or want recommendations on how best to use it. Regardless of what roadblocks they run into, one thing is for sure: There’s no guarantee they’ll achieve what they want to achieve. This is a gaping hole in your business. No one is better positioned to teach your customers about your product than you. No one has more data on what makes your customers successful than you. And no one stands to lose more from getting the customer experience wrong than you. Let me say that one more time, because it’s important: Nobody has more skin in this game than you. In our survey, 80% of respondents said they’d stopped doing business with a company because of a poor customer experience. If your customers are dissatisfied, they can -- and will -- switch to another provider. There are very few businesses in today’s market with no competitors. Once you lose a customer, you are most likely not getting them back. If you fail to make your customers successful, you will fail too. Not convinced? Here’s another way to think about how to best allocate money between marketing, sales, and customer service. Consider Minilytics and Biglytics, both with a CAC of $10 and a budget of $100. Minilytics hasn’t invested in a well-staffed or well-trained customer service team, so their churn rate is 30%. Three customers churn, so they spend $30 replacing them. All of the remaining $70 is spent on acquisition, ending with 17 customers. At Biglytics, things are different. Customer service isn’t the biggest part of the budget, but the team is paid well, trained well, and knowledgeable enough to coach customers who need help. Because Biglytics has proactively spent $10 of your budget on customer service, their churn rate is much lower, at 10% (for the record, a churn rate of 10% is terrible -- we just chose it to keep numbers simple). Biglytics replaces their single churned customer for $10 and spends the remaining $80 on eight new customers, netting out at 18 customers. A one-customer difference doesn’t seem significant. But that $10 Biglytics invested in their customer service team has been working in the background. Customers they brought on last year have seen success with the product because of great customer service, and have been talking Biglytics up to their friends, family, and colleagues. Through referrals and recommendations, Biglytics brings on five more customers without much extra work from the sales team. This means Biglytics has not only brought on six more customers than Minilytics in the same timespan, it also brings down their average CAC to $7.14. Which company would you rather bet on? I’m guessing it’s Biglytics. This is why investment in customer service is so powerful. Taking the long view enables you to grow more. It costs anywhere from 5 to 25 times more to acquire a new customer than to retain an existing one. Prioritizing short-term growth at the expense of customer happiness is a surefire way to ensure you’ll be pouring money into the business just to stay in maintenance mode. A good customer experience goes beyond hiring support staff -- it starts pre-sale. The four points of leverage you can start working on today are where we’d recommend starting. People buy products to fix a problem or improve their lives -- to get closer to an ideal state, from their current state. Your job is to help them get there. Depending on what you sell, much of the work required to make your customers successful might not be done until post-sale through coaching and customer support. But if you understand the most common goals your customers have, you can reverse-engineer your acquisition strategy. “Your best customers stay with you because they get value from your products. Dissect your most successful customers and trace back to how they found you in the first place. Consider whether your sales process could be easier to navigate. Today’s buyers don’t want to talk to a salesperson, or want to pay money before they know how well a product works. You should empower them to do so. If possible, take a page out of “freemium” companies’ playbook. Can you give away part of your product or service at scale so prospects can try before they buy? This way, they’ll qualify themselves and learn how to use your product before you ever have to raise a finger. Anecdotally, HubSpot has seen the most rapid growth in our acquisition through self-service purchases. Also evaluate what parts of your marketing and sales process can be automated. The more you can take off your marketers’ and salespeople’s plates, the better -- and you’ll be giving your buyers more control over their purchase at the same time. This change is already happening. 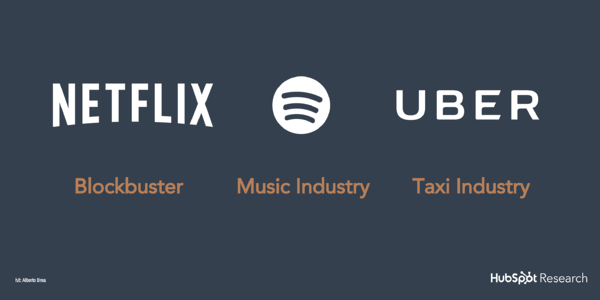 Think about Netflix, Spotify, and Uber. All three companies disrupted industries with difficulty built into their go-to-market. People wanted to watch movies, but they didn’t want to pay late fees. Hello, Netflix. People wanted to listen to music, but they didn’t want to pay for individual songs or albums. Hello, Spotify. People wanted to be driven between Point A and Point B, but they didn’t want to wait for cabs in the rain. Hello, Uber. Today’s biggest disruptors got to where they are by disrupting inconvenience. Hurdles are the enemy -- remove as many as you can. As early as possible, start surveying your customer base to understand how likely they are to recommend your product to a friend. You can also send out post-case surveys to customers whose issues your team has helped resolve. Start small, with a post-support case NPS so you know whether immediate issues were resolved. You can build up to a quarterly or monthly NPS survey of your full customer base that focuses on their general experience with the product. Self-service is the name of the game. Identify your most commonly asked customer questions or encountered issues, then write up the answers into a simple FAQ page or the beginnings of a searchable knowledge base. This will enable your customers to search for their own solutions, instead of waiting on hold to get human support. As an added bonus, it will take work off your team’s plate. Once you have happy and successful customers, it’s time to put them to work for you. Take a look at this chart again. Notice anything interesting? 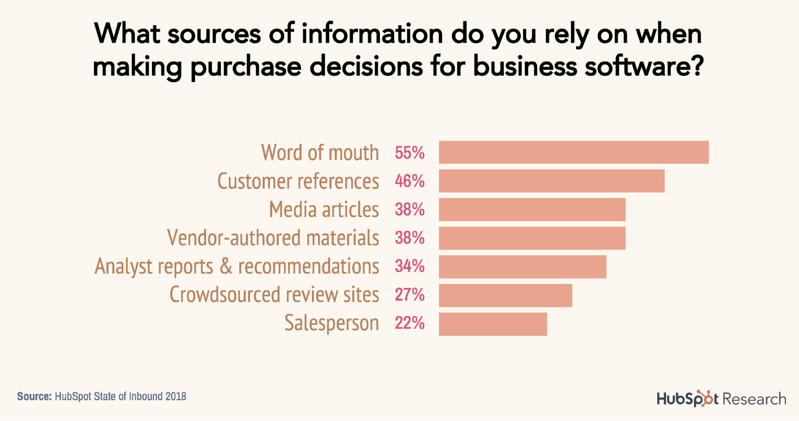 Buyers report that their two most trusted sources of information when making a purchase decision are word-of-mouth referrals and customer references. They’re listening to your customers, not you. Use your customers as a source of referrals, social proof for your business through testimonials, case studies, and references, and brand amplification. The key to successful customer advocacy is to not ask for anything too early. Don’t try to extract value from your customers until you’ve provided value -- asking for five referrals a week after they’ve signed a contract is inappropriate. Your primary goal should always be to make your customers successful. After you’ve done that, you can ask for something in return. This methodology is a direct result of my eight years at HubSpot. We’ve made a lot of mistakes but learned even more about how built a repeatable playbook for leading your customers to success and eventually turning them into promoters. We call it the inbound service framework. Good customer service is the foundation for everything else -- that’s why “Engage” is the first part of this framework. At this stage, your only concern should be understanding the breadth and depth of customer questions, and resolving them. When you’re just getting started with the customer service function, cast a wide net. Engage with any customer, wherever, about whatever they want. Be on all the channels, try to solve whatever problems come your way, and help anyone who needs it. Above all, make sure you’re easy to interact with. At HubSpot, we found that customers who submitted at least one support ticket a month retain at a rate around 10% higher than customers who didn’t, and were 9-10 times more likely to renew with HubSpot year over year. Not getting support tickets does not mean your product has no issues -- every product does. It means your customers are silently suffering. When support issues arise -- do people require implementation help or do they encounter issues three months after purchase? This information will empower you to identify huge points of leverage in your customer service motion. For example, if you find that 30% of customer queries have quick, one-and-done answers (i.e. “How do I change my password?”, “How do I track my order?”, “What is your return policy?”), stand up a simple FAQ page to direct customers to. Boom -- you’ve freed up 30% of your team’s time to work on more complicated, specific issues. Empower your customer team to make noise about the problems they see, early and often, and turn their insights into action. Are your sales and marketing teams overpromising to your customers? Your customer team will hear these complaints first. Trace the points of confusion back to their origin, and change your sales talk tracks and marketing collateral to reflect reality. Is there something about your product that causes mass confusion? Your customer team will know which parts of your product/service are most difficult to navigate and why. Use this information to improve your product/service itself, eliminating these problems at the source. Do certain types of customers run into issues frequently? Do they usually churn or do they just require a little extra love to get over the hump? If it’s the former, build an “anti-persona” your sales and marketing teams should avoid marketing and selling to. If it’s the latter, dive into that cohort of customers to understand whether the extra help they need is justified by their lifetime value. As you learn more about your customers, you’ll also learn how to best optimize your own process. Identify the most effective support channels for your team and create a great experience for those, then establish a single queue to manage all inquiries. In this stage, measure success by how fast you solve problems and post-case customer satisfaction. You can do the latter through a post-case NPS survey, which gives you instant feedback on how effective your customer team actually is. First, it means anticipating common issues and challenges and building resources to prevent them. This includes things like a knowledge base or FAQ, as well as re-engineering parts of your offering to be more user-friendly and intuitive. Second, it means partnering with your customers to help them get to their stated goals. 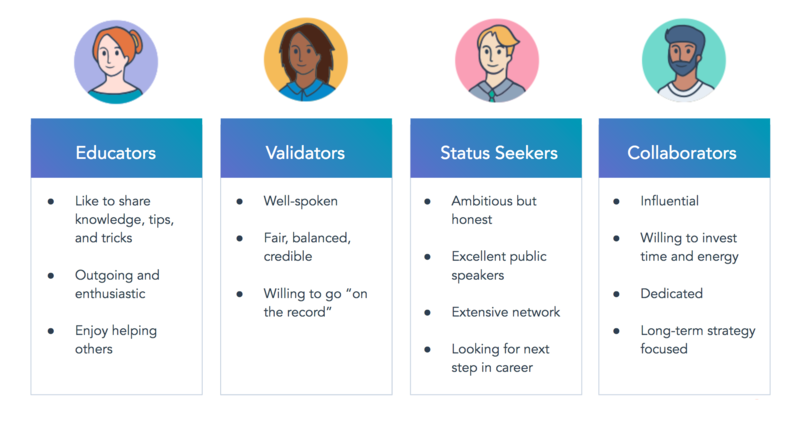 Guide them through key milestones, provide tasks to keep them on track, and connect them with peers so they can crowdsource answers if necessary. Create frameworks and tutorials where you can. It saves time, and time is money. Imagine all the hours you’ll save your support team if you can get repetitive queries off their plates. That’s time they should spend on complex, higher-level issues that could reveal even larger points of leverage in your business, and so on. It makes your customers happier. Even if you’re able to resolve issues at an 100% success rate with 100% satisfaction, you’ve still built an experience filled with roadblocks. Aim to build a world where you’ve anticipated your customers’ challenges and solve them at their source. It builds a trusting relationship. Customers may not see all the issues you proactively guard against (after all, a problem prevented is an invisible type of value), but they’ll recognize a relatively issue-free customer experience. Buyers are more likely to trust the company that rarely lets them down, over a brand that’s constantly scrambling to fix the next issue. It’s a competitive advantage. Proactive guidance takes the wealth of knowledge you have about what makes customers successful and puts it into your customers’ brains. You know what your best customers have in common and the mistakes your least successful ones make. That knowledge is a core part of what you’re selling, even if it’s positioned as customer service. As you move away from proactive support into proactive guidance, you become a teacher, not a vendor. Other companies might be able to build a product as good as yours, but it’ll be difficult to replicate the trust you have with your customers. Guidance is an iterative process. As in the early days of your customer organization, collect as much data as you can on the customer lifecycle, and continuously update your guidance to reflect current best practices. Pay attention to the formats and channels that work best, which issues have the highest impact for your customers once solved, and update your process accordingly. Happy customers want to support the businesses they love. 90% of consumers are more likely to purchase more, and 93% were more likely to be repeat customers at companies with excellent customer service. At the same time, 77% of consumers shared positive experiences with their friends, or on social media/review sites in the last year. Your happy buyers want to help you. That’s what the “Grow” stage is all about: Turning that desire into action. There are three ways to activate your customer base into promoters, says Laurie Aquilante, HubSpot’s director of customer marketing: Social proof, brand amplification, and referrals. Let’s review each play. Activating social proof is all about keeping a close watch on your customers. It’s also not a pick-one-and-done kind of thing, Aquilante says. Case studies and customer references, for example, are useful at different points in your sales motion. While you could use the same customer for both, it’s probably more useful to have a stable of customers on hand that can speak to a diverse range of experiences. Encourage social proof by proactively reaching out to your most satisfied customers, who will likely be excited to help you. You can also provide incentives for sharing content or writing online reviews. When someone shares your content on social media, helps contribute content for a campaign, or interacts with your content, they’re amplifying your brand. Referrals have the most immediate monetary value for your business. B2C companies are masters at the referral game, usually awarding the referrer credit to their account or even monetary rewards. B2B referrals are a bit trickier. B2B purchases tend to be more expensive than B2C purchases, and usually involve multiple stakeholders and a longer sales process. So your customer likely has to do some selling upfront to feel comfortable sending a contact’s information to you. It’s not impossible to get this right, but it’s crucial to offer your customer something valuable enough to incentivize them to do this work on your behalf. A note from our lawyers: These results contain estimates by HubSpot and are intended for informational purposes only. As past performance does not guarantee future results, the estimates provided in this report may have no bearing on, and may not be indicative of, any returns that may be realized through participation in HubSpot's offerings. Aside from promoting your brand and bringing you business, your customers are themselves a source of net new revenue, if you have multiple products or services. Your customer team is your not-so-secret weapon in unlocking this revenue. 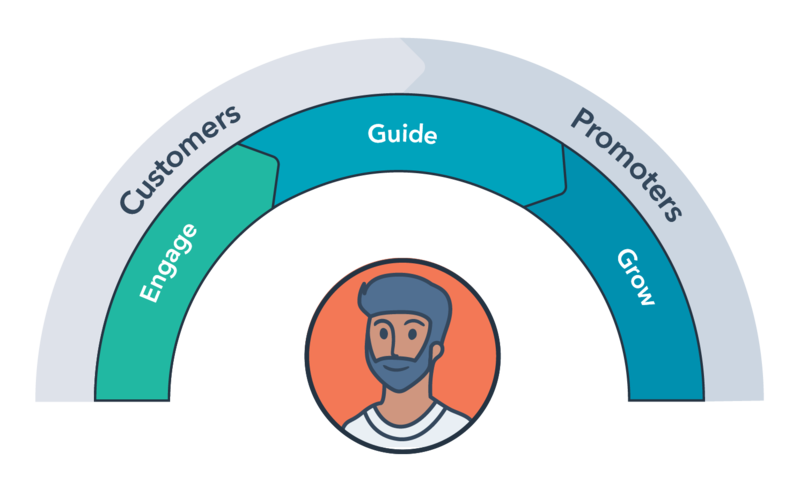 In late 2017, HubSpot piloted the concept of “Support-Qualified Leads” at HubSpot. Our sales team owns selling new business and upselling/cross-selling those accounts. But our support team is the one actually speaking with customers day in and day out, so it’s just intuitive that they have a better understanding of when customers reach a point where their needs grow past the products they currently have. When a customer has a new business need and has the budget to expand their offerings with HubSpot, a customer success representative passes the lead to the appropriate salesperson, who takes over the sales conversation. The Support-Qualified Lead model is powerful because it closes the loop of communication between sales and support, and it works -- in its first month, the pilot generated almost $20,000 in annual recurring revenue just from cross-sells and upsells. Since we’ve rolled this out, we’ve generated over $470,000 in annual recurring revenue just from this model -- nothing to sneeze at. Growth has always been hard. If you’re just starting out, it’s hard to imagine ever competing with the top companies in your industry. Customer service is the key to this equation. If you provide an excellent customer experience and can create a community of people who are willing to promote your business on your behalf, you’re laying the groundwork for sustainable, long term growth. And in a world where acquisition is hard and getting harder, who wouldn’t want that? Michael Redbord is the Vice President of Services & Support at HubSpot.